year’s team. - Owens is now 69-1 at home, which includes 20 straight wins, since February of 2012. - After spending the first six polls of the season at No. 3, Owens has spent the past three weeks ranked No. 2, which ties the highest ranking in program history. - In OCCAC play, Owens leads the conference in the following team categories - total points, PPG, FGM/game, FGA/game, 3-pt FGM/game, 3-pt FGA/game, offensive RPG, total RPG, rebounding margin, assists/game, steals/game, blocks/game, PPG allowed, opponents FG percentage and opponents 3-pt FG percentage. They are also second in FG, 3-pt FG and FT percentages. 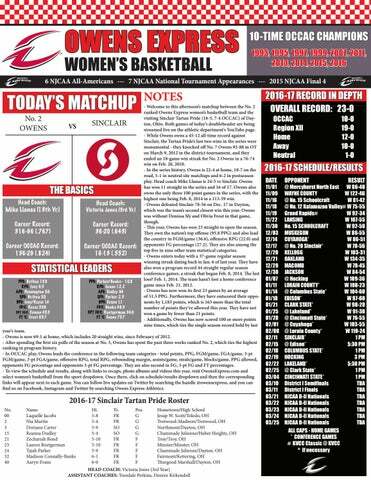 - To view the schedule and results, along with links to recaps, photo albums and videos this year, visit OwensExpress.com and select women’s basketball from the sport dropdown. Once there, click on schedule/results dropdown and then the corresponding links will appear next to each game. 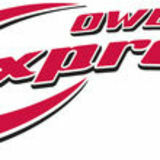 You can follow live updates on Twitter by searching the handle @owensexpress, and you can find us on Facebook, Instagram and Twitter by searching Owens Express Athletics.